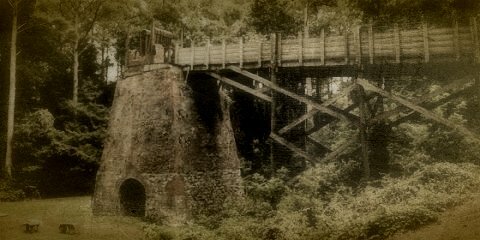 It is common in the annals of ghostlore to hear the stories of spirits who have returned to haunt a certain place because of some deed which they never completed, or because they simply never wanted to leave.... but the story of Sampson Hat and Furnace Town is a little different. The glory days of the place called Furnace Town only lasted for a few years, but they made a lasting impression on the region. In 1832, the Maryland Iron Company began operating the Nassawango Iron Furnaces, employing hundreds of people, mining and smelting ore and burning the furnaces day and night. Molten ore was poured into bars and then loaded onto barges that would taken them down Nassawango Creek to the Potomac River and then to Chesapeake Bay. From there, the iron was shipped all over the country. Not surprisingly in those days, many slaves were put to work doing the hottest, most dangerous jobs. One of these slaves was a man named Sampson Hat. The Maryland Iron Company bought all of the land where Furnace Town was located. For several years, they did quite well, but then competition opened up in other parts of the country. Finally, in 1833, the company went bankrupt and they started looking for a buyer for the town. Although the sale was to include the furnace, a grist mill, a sawmill, a mansion, homes for the iron workers, a store and a number of other businesses as well as the land it all rested on -- and despite the fact that the asking price was very reasonable --- there were no buyers until 1837. At that time, Judge Thomas A. Spence decided that he liked the idea of owning his own town. Both Spence and his wife were quite wealthy when they bought the town. Many of the workers came back and the slaves were once again leased out, including Sampson Hat. The little village named Pocomoke Forest flourished, but it was an expensive endeavor and in 10 years, Spence lost both he and his wife's fortunes. By 1847, he had spent all of the money he had and he was forced to close the furnaces down. The people whose lives depended on the foundry moved on to other places, abandoning their homes and businesses and the slaves were moved on to other tasks -- all except for Sampson Hat. He simply refused to leave. He lived on in Furnace Town by himself, surviving on what he could make do with. He was eventually forgotten and after the Civil War was set free, although he had not labored as a slave for more than 20 years. Eventually time caught up with him and he died at the age of 107. Sampson made it perfectly clear --to anyone who would listen -- that he wanted to be buried at Furnace Town when he died. But for some reason. his final wish was not granted and his body was placed elsewhere..... and many believe that is why his ghost is still haunting the place today. After Furnace Town and Pocomoke Forest were abandoned, nature and time took its toll on the village and buildings and they slowly deteriorated. Then, in 1962, a family named Foster bought the town and gave it to the Worcester County Historic Society. It has since been restored and opened as a museum. And through it all, the ghost of Sampson Hat has stood watch. The apparition of a tall black man has been seen walking through parts of the small village over the last several years, especially during the restoration efforts. And he doesn't appear to have plans to go elsewhere. Perhaps he got his final wish in the end. He may not have been buried at Furnace Town, but there is a good chance that Sampson Hat has never left.